Generate power with "CW Tall PVC Hurdles" agility, and plyometric training hurdles. Bring your athletic performance to the next level as you build strength and explosive speed with the 6 X Hurdles. These hurdles have innovative back bounce construction, and maintain their shape, even after being used by the toughest athletes. Each hurdle offers a highly durable base with PVC base construction of all sizes. 6 X Hurdles are ultra-durable with a superior, one-piece twist design. At 6" high, they help to develop quick feet so you can output maximum power and footwork no matter your sport. These lightweight, and low profile hurdles stand sturdy during practice, but break down small. They come in a convenient carrying bag, making the drills that much easier to set up and break down. Cricket World is dedicated to helping athletes of all levels reach their goals. No matter your sport--baseball, soccer, football, or basketball--the 6 Hurdles will help you reach peak performance around the field, court, or pitch. 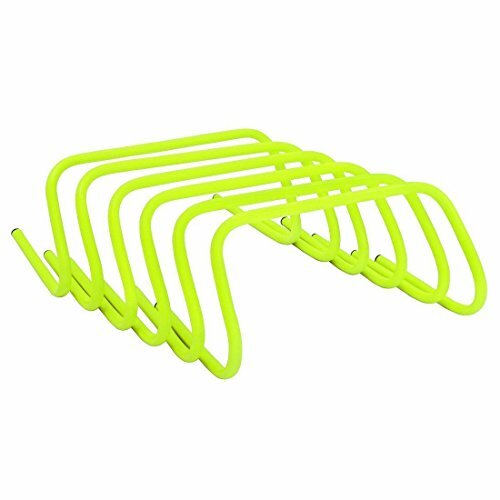 AMBER Athletic Gear Mini Hurdle (Set of 6) 9"